We’ve made a couple of changes to the prototype that we’d like your opinion on. First: the door. The one you’ve seen is a narrow submarine like door, ideal for claustraphobic setups. However you can’t stand in the doorway, just either side. 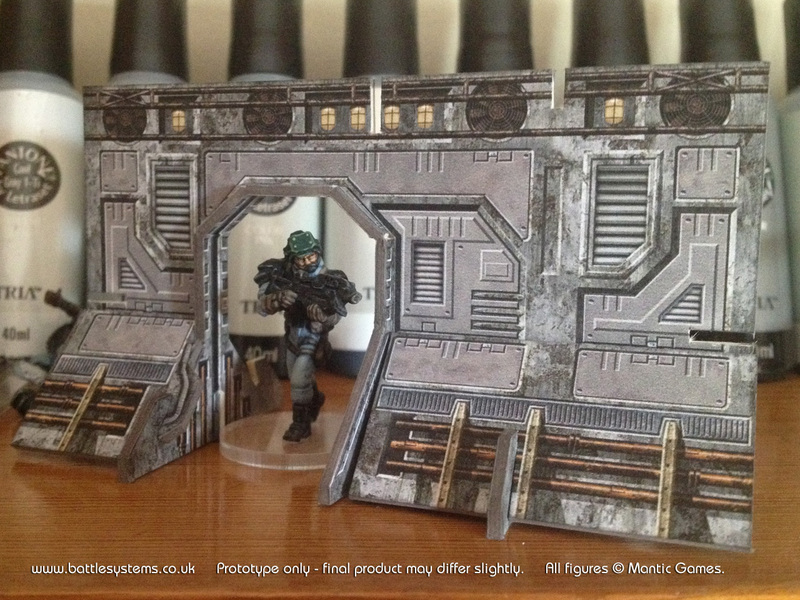 We’ve made a slightly wider version where your figures can actually stand in the doorway. Q. which do you prefer? Or do you prefer the narrower doorways which you stand either side of? Secondly, we’ve redesigned the railings. The current ones are knocked too easily and may be a nuisance during gameplay. We’ve made a tougher set that are much sturdier. 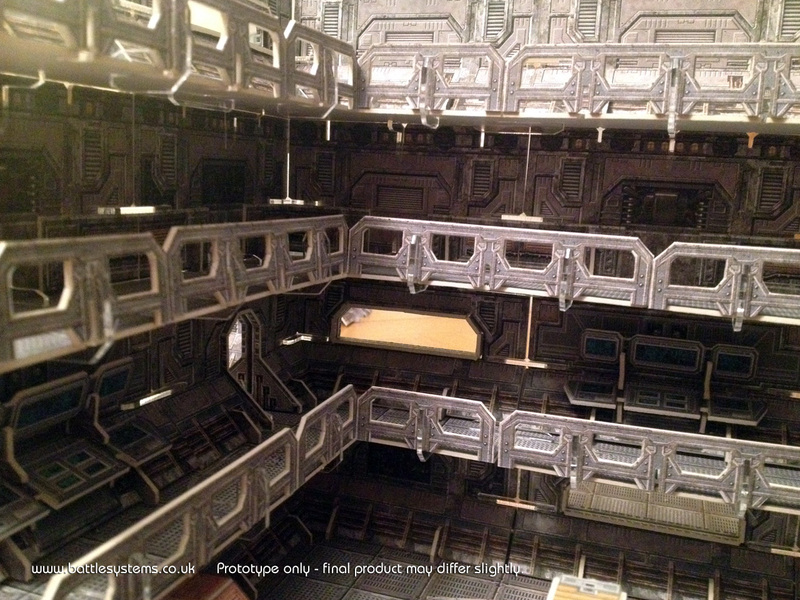 We may also add a back that clips on to give your figures more cover. 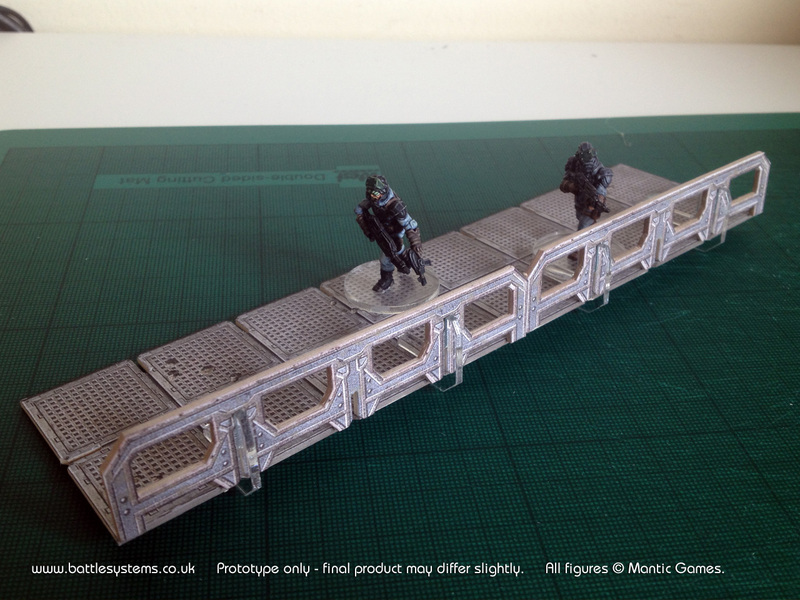 New railings: all tough and rugged like Battle Systems at the gym. The old railings are cool but fall off from even the smallest nuclear explosion. Spindly railings replaced with kick-bottom railings. 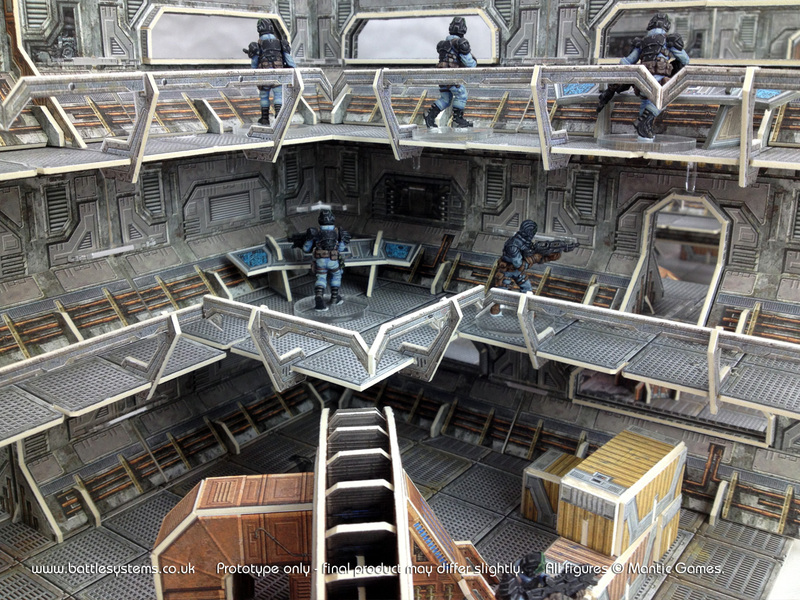 Ideal for Block Wars, Dredd fans. 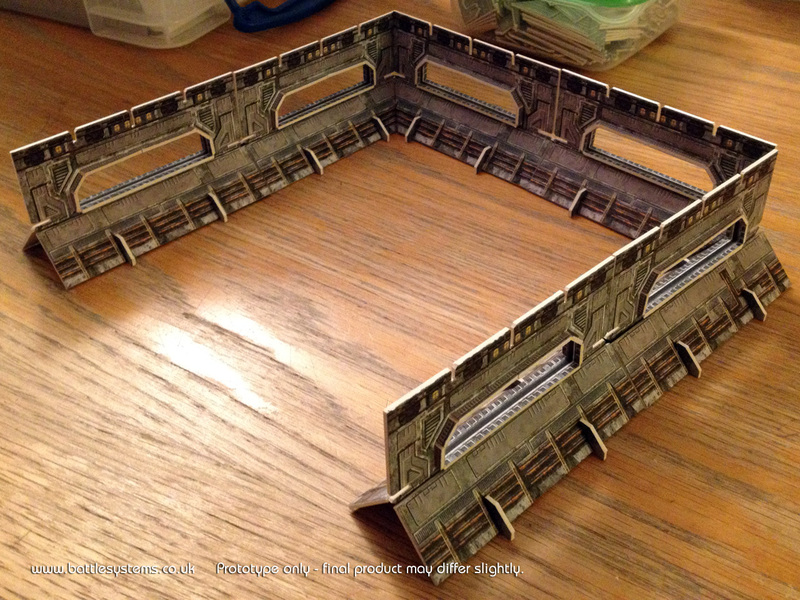 With the Kickstarter approaching we’ve been working hard on the extras for the stretch goals. Most are hush hush but we thought you could have a sneak peek at one: the elevator. Primarily a stretch goal, we expect the elevator to become essential kit for anyone who likes to build up high terrain so it will probably become available as part of an expansion pack or even its own set of different size elevators and ladders to complement the two man lift shown here (let us know if a set is something you would be interested in). Take the stairs like a sucker? Bwa ha ha ha! 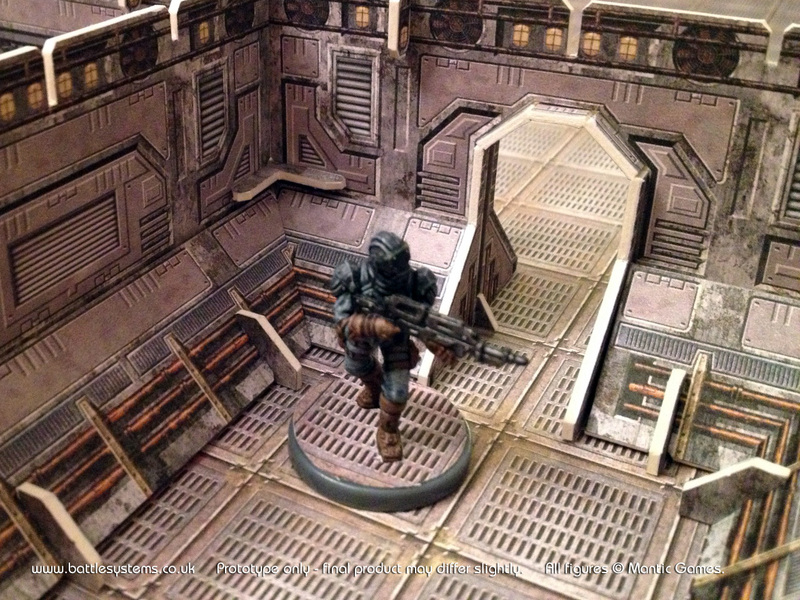 The elevator is damn nifty, especially for scenery heavy and claustraphobic games such as Infinity or Necromunda. Don’t want to run up steps risking life and limb? Course not. Want to use your allotted movement going vertically not diagonally? You’re talking our language. We will show more sneak peaks as we get closer to the Kickstarter. One thing that may become a stretch goal is the window. You’ve no doubt seen the windows by now, in fact we can’t imagine the set without them. However, no matter how we juggled we couldn’t get them into the Starter or Expansion sets (both bulging as they are). Will we release them as expansions at a later date? Or add them as stretch goals? You decide*. Remember in the last newsletter I said we’d made a lot of important contacts at the Birmingham Expo? (If you don’t remember you need to sign up for the newsletter, it’s completely painless, apart from my writing). Well, we’ve been commissioned to design products for other companies, ones that you will know very well. We will tell you more closer to their release dates. But don’t worry, this is not affecting the rate of our Kickstarter project which is moving at the rate of manufacturing enquires (le. slow but sure).